There is nothing quite like travelling, be it a short trip or a longer journey with tired and/or bored children. We've all been there and we all know how stressful it may be on both parents and children. 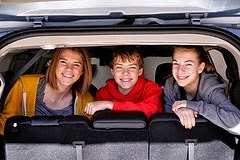 To help avoid these situations we've put together this mini-guide to help you all enjoy a calm, fun and safe journey this half term and for all future road trips. If you are prepared for the worst anything else may be seen as a bonus. In the event of a breakdown it is essential that you have a breakdown box in the car with drinks, snacks, essential medications and of course things to amuse the children. If you are lucky enough to have broken down near a safe grassed area a ball or a Frisbee makes a great distraction activity (and burns off some of the excess energy) and if not paper games, simple card games and similar novelties will make passing the time before you are back on the road much more pleasant for everyone. It is essential that the kids are in the right type of car seat for their age and height. Up until the age of four years children should be a Group 1 car seat. From four years onward the rules are often confused. This handy car booster seat guide from Halfords clears up any confusion about what types are best and for what age. The right type of car seat will keep your children safe in the event of an accident and will also eliminate any discomfort felt which could be occur if the child was in the wrong type/size of car seat. Avoid boredom by having age appropriate drinks and snacks, toys, games and items which will amuse children throughout the journey to hand. Using a specially designed caddy or over the seat tidy makes it easy for children to access these items themselves. Car games (knock, knock ding-a-ling was a firm favourite when some of us at Dotty Hippo HQ were younger!) as well as audio books, music and in-car DVD players for longer journeys all offer great solutions for beating travel boredom. For long journeys toilet / changing breaks are important however these times also offer a great opportunity for the children to let off steam. If there is a play-park at your rest-stop or an open yet safe area encourage them to stretch their legs and get a little exercise before getting back in the car. If you are lucky enough to enjoy dry and even warm weather there is no better way to spend your days off and holidays than getting out in the fresh air and going for an adventure. It is never too early to teach your little ones how to cross the road safely and every day trips out as well as holiday outings make for the ideal time to practice these skills. Teaching little ones to hold hands, pushchairs and walk independently is all part of them growing up and thankfully using walking accessories such as the Sure Steps security harness from Diono allows them a little freedom while parents and carers remain in complete control of their safety. On dull days, early morning and of course in darkness it is essential that when walking out and about that you and your children may be properly seen by road users including cyclists as well as others on the paths. Everyone wearing fluorescent jackets or waistcoats with reflective bands when out and about, as well as having a light and reflective stickers or similar on pushchairs will ensure that your party may be seen at all times. It is amazing how much "stuff" you tend to take with you when walking out with children. There are snacks, drinks, tissues and wipes, changing items, toys and often much more. Rather than weighing down the pushchair handles and risking tipping whey not use a stroller organiser such as this one to keep everything to hand and safe? If you aren't using a pushchair anymore and want to keep your hands free for holding little ones and playing use a backpack with handy pockets for everything you need. Ensure that you choose one with two straps so that you may spread the weight of what you are carrying and avoid back ache. Whatever you have planned for this half term we hope you have a suitably wonderful time!